The 120th release on Tash’s Movement Recordings welcomes Stas Drive back to the label for a brand new single. The Ukrainian producer is fresh off the release of his Beatport Top 10 ‘Wide Eyed Angel’ single, in addition to a stellar offering on Spaghetti Monster. 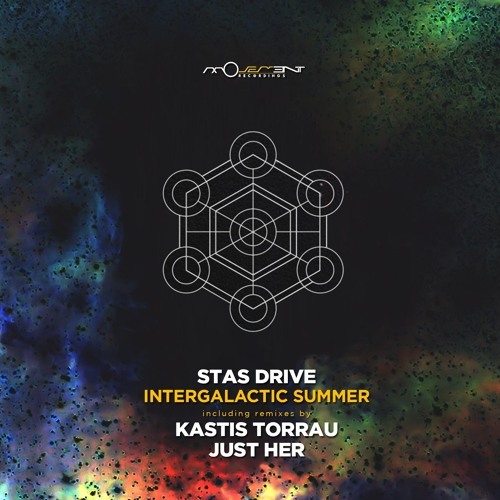 Stas Drive now presents what is perhaps his most anticipated single to date entitled ‘Intergalactic Summer’ alongside remixes from Kastis Torrau and Just Her. As 2015 has progressed Stas Drive has continued to explore different stylistic blueprints with exceptional results. With ‘Intergalactic Summer’ we see Stas crafting a journey into deep grooves and ethereal designs. Backed by a wall of sub bass the Ukrainian expertly works a vocal story board along with an array of effects which tantalize the senses. As melodic clusters initiate the breakdown the vocals fade into prominence, both furthering the narrative and building tension. It’s a dramatic apex as a rush of drums brings the groove back with new found bass tones and metallic sketches piercing the air, for that ultimate dance floor moment. Surely one of Stas Drive’s best and most sought after productions of 2015. The first interpretation of ‘Intergalactic Summer’ is provided by Lithuanian artist Kastis Torrau. Long regarded as one of his countries foremost electronic music talents, Kastis first rose to prominence as the winner of the Sasha Burn Studios remix competition. Years later he continues to be one of the underground’s most in demand artists having his work featured on Click Records, Sound Avenue and Proton Music. Renowned for his pristine production traits, Kastis reworks ‘Intergalactic Summer’ into a chunky dance floor beast. Anchored by rough bass stabs, the spacious groove carries a smooth hypnotic swing as indistinct vocals and waves of percussion build momentum. As the tonal lead drops, a vocal rearrange furthers the vortex-like effect and initiates the main break. Here the full vocal complement shapes the space, furthering the journey and ultimately driving the track to a strong conclusion. Another sure fire dance floor bomb from the Kastis. The second and final interpretation of ‘Intergalactic Summer’ is provided by Just Her who is making her first appearance on Movement Recordings. A long time purveyor of intelligent electronica the UK producer is perhaps best known as the engineer and songwriter for the Him_Self_Her production duo. Now putting the focus on solo studio work, Just Her has already found a home on Chapter 24, Click Records, Suara, Save Us and her own Constant Circles imprint. Here she makes a welcome debut on Movement Recordings remoulding Stas Drive’s ‘Intergalactic Summer’ into a slice of deep, atmospheric techno. Great use of the vocal elements in conjunction with a reworked and perfectly contoured groove sets the track in motion. As it’s growling foundation grows ever ominous, angelic pads add a wonderful contrast and lead the track into the main break. A more distinct motif highlights the second act, celestial and hypnotic in nature, descending over the framework as the vocals intensify. Finely tuned modulation builds tasteful tension, before a quick drop sets up a third act audio collage of synth swells, indistinct vocals and textural drifts. A brilliant interpretation from Just Her which complements the previous two versions wonderfully and rounds the release out on a strong note.